I’m embarrassed to admit that I’ve gotten myself into way too many online arguments about politics and religion over the years (though I have gotten better), and I’m not happy with either my own behavior or others. All the cognitive biases (see my encyclopedia in Random Jottings 6) are on display, and hardly anyone actually speaks to the other side. 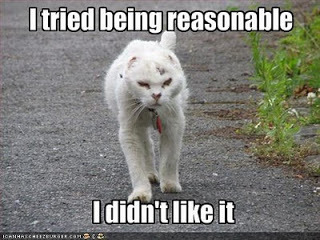 Unreasonableness is rampant. The problem is that what’s reasonable tends to be subjective. Obviously, I’m going to be biased toward thinking people who agree with me are more reasonable than those lunkheads who don’t. But that doesn’t mean there aren’t objective standards for being reasonable. To find out what those standards are, I needed to compensate for my bias, so I identified three groups of people to study. In addition, I looked at some of the classical standards for reason, and also reviewed some of the basic communications concepts we use in business. I learned some of the following through observation, and most of it through the contrary experience of doing it wrong. You’ve heard some of the advice elsewhere, but a reminder every once in a while comes in handy. 1. You’re not being reasonable if you don’t construct your arguments using reason. Classical argument operates by rules. There is a proper structure for proof. Some proofs are invalid, riddled with structural errors. Failure to follow the rules of reason is, by definition, unreasonable. A good description of classical rules for arguments and a list of common fallacies can be found here. 2. You’re not being reasonable if you don’t acknowledge your own biases and blind spots. Before you deal with the mote in your brother’s eye, deal with the plank in your own. The problem with that advice is that it’s hard, by definition, to see a blind spot. Because some biases are universal, you can at least acknowledge that you have those. Remember too that because a decision is biased doesn’t mean it’s automatically wrong. I have a bias toward trusting people. I don’t think that’s a fundamental error; it is, however, a risk. I don’t want to get rid of the bias; I simply want to be aware of it so I can correct my own observations. 3. You’re not being reasonable if you don’t take the time to find out what the other person really means. If there’s a misunderstanding about what they mean, remember that it is they — not you — who are the official judge of that issue. It’s fair they should acknowledge that their initial statement may have been infelicitous, but they’re entitled to revise their thoughts for greater clarity and accuracy. You have to let the old phrasing go after they change it. 4. You’re not being reasonable if you don’t take the time to figure out why the other side believes what they believe. While it’s instructive to define what are our differences, it’s fundamental to probe the underlying reasons why we believe these things. If the difference between us is a fundamental value, it’s not subject to contrary proof by logical argument. Acknowledge the difference, and move on to the next phase, which may be walking away or getting ready to rumble. If, on the other hand, our fight is between which of two roads is the best way to our shared destination, there’s no need to get hostile about it. One or more of us might in fact be wrong, but all have the same end goal in mind. 5. You’re not being reasonable if you don’t separate emotional outbursts from logical reasoning. If the matter is serious enough, emotions are going to break through. It’s not practical to regard such lapses as evidence of moral failure. What does constitute failure to be reasonable is failing to curb the outbursts before they get out of hand, and failing to apologize (or failing to accept an apology, even a grudging one) when you’ve stepped over the line of good manners. Labeling an emotional outburst an emotional outburst helps, but doesn’t undo all the potential consequences, any more than labeling a bomb “BOMB” constitutes an acceptable safety program. 6. You’re not being reasonable if you only expose yourself to one type of information. Always read at least one news source that strongly contradicts your worldview, and make sure you understand what they actually believe and why they believe it. If you have no idea why they think what they think in the first place, what makes you believe you can come up with a persuasive argument to change their minds? 7. You’re not being reasonable if you don’t acknowledge your mistakes and apologize generously. Factual errors, misrepresentations of the other side’s opinions, violations of good manners — people who own up quickly and generously are considered a lot more reasonable than those who don’t. An accusation that you’ve done something wrong isn’t automatically proof that you have done so. Or maybe you did and still believe you’re justified. If there’s doubt, a good judge is someone known to be reasonable who leans toward the other side. If that person thinks you’re out of line, maybe you should listen. If a reasonable person on the other side thinks you’re being reasonable, that’s a fairly encouraging sign. If the situation’s mixed, you can apologize for your fair share (err on the side of generosity) without having to own all the blame. If the other person tries to shove it down your throat, understand that other reasonable people will be more inclined toward you if you don’t return the aggression. 8. You’re not being reasonable if you don’t separate what you know from what you believe. You don’t know it if you can’t prove it by empirical, external means. Facts can generally be proved to the satisfaction of someone else. Beliefs aren’t necessarily subject to the need for external proof, but you can’t demand someone accept your belief the same way you can demand someone accept a demonstrable fact. 9. You’re not being reasonable if you don’t stay out of fights that aren’t any of your business. And yes, I’ve been guilty of violating many of these rules myself. Hypocrisie est un homage que la vice rend á la vertu. Which rules of reasonableness have I missed?